However, delivery of the most anticipated advance, a 64-bit mobile Application Processor, was pushed out indefinitely into the future at the company's "Analyst Day" event, offering scant hope for an Android answer to Apple's A7 anytime soon. The company's all day investor conference began Wednesday with an introduction by Sang-hoon Lee, Samsung's president and chief financial officer, who outlined 2013's estimated revenues of $211 billion U.S., with profits of $35 billion. For the first half of the year, Samsung said 11 percent of its revenues came from Korea, 28 percent from America, 23 percent from Europe and 18 percent from China, with a remaining 20 percent from all other regions (as presented in the bizarrely ratio-inaccurate pie chart above). Capital expenditures for the year were estimated to reach $22 billion, versus Apple's reported $7 billion in capex (less than the $10 billion Apple planned to spend in 2013). The company said its investments were shifting from building up manufacturing capacity toward the development of new markets and technology, while Apple has reported the reverse: that much of its capital investments are directed to infrastructure, particularly manufacturing capacity. Samsung also outlined "key strategic shifts" from hardware sales to a software focus, and from a components business to shipments of more finished devices. Again, Apple has had a strong software focus since the early 1980s, with AppleWorks, Lisa Office and the Macintosh, and has continued a strong focus on iOS and OS X bundled apps, Pro Apps, iWork and iLife, and its other App Store titles. Samsung's new strategies increasingly put the company in more direct competition with not only Apple, but also Samsung's other component customers as well as Google and Microsoft, the companies that currently supply Samsung's mobile, netbook and PC software platforms. While not directly addressed during its investor event, Samsung's latest build of Tizen (below), the Linux-based mobile platform salvaged from the ashes of MeeGo (itself the merger of the abandoned efforts of Intel's Moblin and Nokia's Maemo), appears designed to serve as a drop in replacement for Google's Android or Microsoft's Windows Phone while coincidentally stumbling upon interface elements more than a little reminiscent of Apple's new iOS 7. JK Shin, Samsung's president and chief executive of IT & Mobile (the business segment of Samsung Electronics that compares closely with Apple), outlined his outlook for the smartphone and tablet markets, promising that the company would "play a key role in the premium smartphone market." 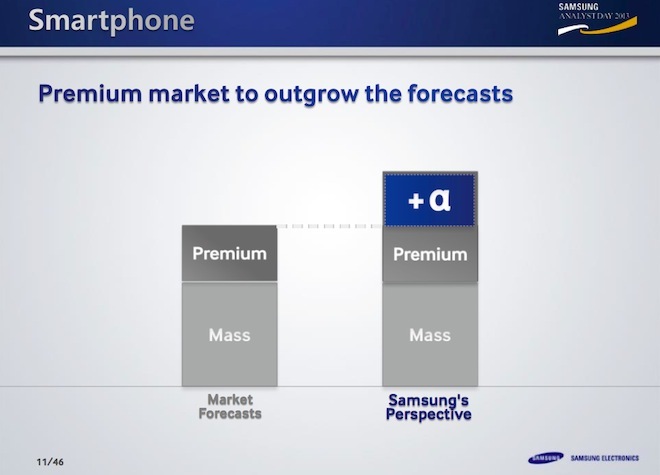 He stated that from Samsung's perspective, the premium market will continue to outgrow market forecasts (above), an apparent reversal of the company's warnings from the beginning of the year about increasing competition in the plateauing market for premium Android smartphones. 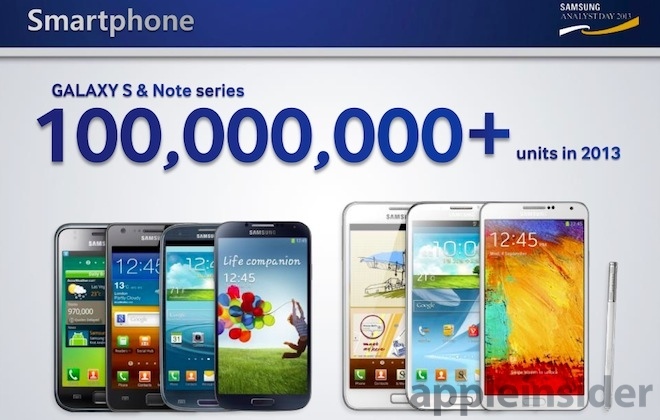 That also seems to contradict Samsung's sales results throughout the year. The company just stated that in its September quarter, premium smartphone sales "stayed about the same" rather than keeping pace with Apple's growth, which comes entirely from premium smartphones. Shin also presented some of the first solid numbers of Samsung's premium smartphone sales, noting that total sales of Samsung's Galaxy S and Note products were expected to reach 100 million for 2013, well below Apple's fiscal year sales of 150 million iPhones and only about a third of the number of total "smartphones" Samsung is regularly reported to ship. Next up, Dr. Namsung Stephen Woo, president of Samsung's System LSI, reviewed the state of the semiconductor industry, noting in particular the slowing overall growth occurring on the premium end of smartphones and tablets. Citing data from Gartner and Strategy Analytics, Woo depicted mid-range and low-end phones increasing by an estimated 22 percent next year, while premium phones are expected to only increase by 9 percent. 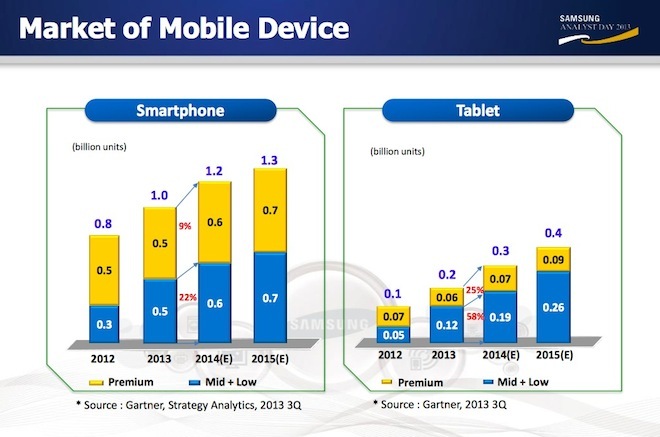 In tablets, a similar shift toward growth in the middle and low end were noted, with an inexplicable retraction in high end tablets presented as having occured this year compared to 2012. 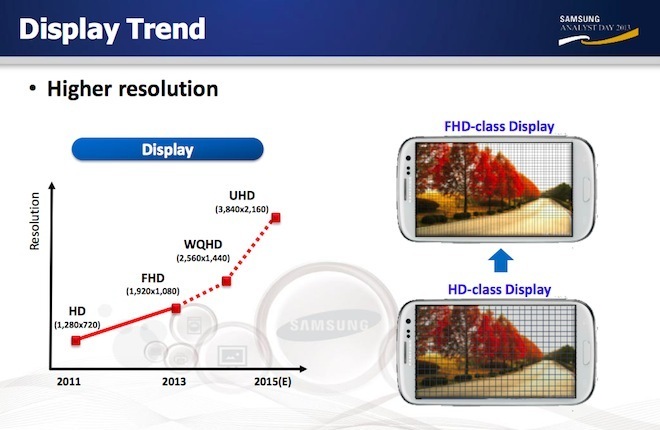 Woo next predicted a display trend of ever increasing resolutions and pixel density on mobile screens, ramping from 1080p screens Samsung began fitting into its mobile devices this year to "WQHD" screens next year with a 2K resolution of 2560x1440, nearly as great as a 13 inch MacBook Pro with Retina Display. He also predicted that even higher resolution 4K "UHD" 3840x2160 displays would come into the mobile device market by 2015. He didn't specify why mobile devices would immediately need such incredible bit densities, but did note that such resolutions would demand far higher processing power. Woo next turned to camera sensor trends, predicting a leap from 13 megapixel mobile cameras to 20 megapixels in two years. He also addressed specialized camera software that already exists, from HDR to face detection and image stabilization. "As you can see in the graph, the resolution number goes up," Woo explained. Shifting to a similar graph showing numbers getting bigger in Application Processors, Woo described three advanced technologies Samsung was working on in chip fabrication: Widcon (wide connection) a high bandwidth memory interface Woo contrasted with the LPDDR3 memory standard; the FinFET process for building advanced 10-14nm silicon, and 64-bit CPU cores for mobile Application Processors. 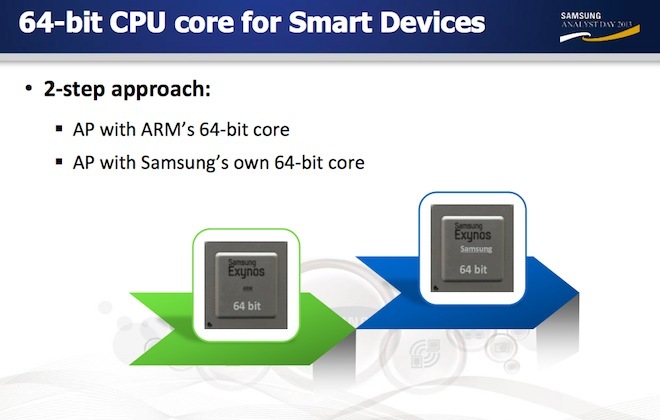 Alluding to Apple's custom 64-bit A7 Application Processor (which Samsung is manufacturing), Woo said "many people were thinking 'why do we need 64-bit for mobile devices?' People were asking that question until three months ago, and now I think nobody is asking that question. Now people are asking 'when can we have that? And will software run correctly on time?'" "For the second product after that we will offer even more optimized 64-bit based on our own optimization. So we are marching ahead with the 64-bit offering, and even though it's a little too early, I think we are at the leader group in terms of 64-bit offerings." 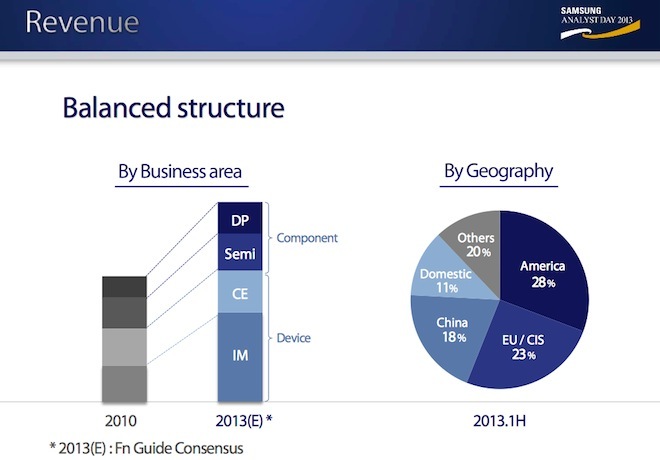 Unlike the detailed roadmap charts for extremely high resolution mobile displays and rapidly increasing camera sensor pixel density releases over the next two years, Woo did not offer any other details about Samsung's 64-bit AP plans, despite acknowledging that such sensors and cameras necessitated vastly greater processing power. Woo also offered no comment on how Samsung planned to support existing software on its planned 64-bit offerings, nor even whether such a chip would get custom Android support or use Samsung's own Tizen or some other operating system. Woo also didn't outline any novel uses of 64-bit computing comparable to the applications Apple launched for the iPhone 5s, which included advanced video game graphics, enhanced audio and video processing apps like Garage Band and iMovie, and Touch ID processing and secure storage. Samsung didn't make any apparent mention of efforts related to fingerprint recognition. 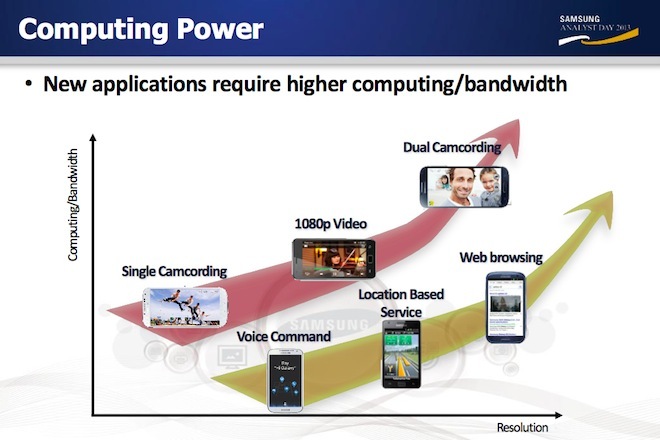 Instead, the only new example of applications that "require higher computing/bandwidth" depicted in Samsung's presentation was "dual camcordering." Samsung's advanced chip fabrication technology and capabilities are extremely rare among fabs globally, forcing Apple into partnership (for now) with the company to fabricate its advanced A7 design. However, Samsung's reticence to plot out a confident 64-bit roadmap in detail, despite acknowledging that 64-bit is an important advance for mobile devices, illustrates the vast gulf between being able to fabricate an existing chip and begin able to custom design a new one.